Malaysia’s economy expanded by 6.2% y-o-y in Q3 2017 (Q2 2017: 5.8% y-o-y). Unemployment rate remains unchanged at 3.4% in Q3 2017. Headline inflation, measured by the annual change in the Consumer Price Index (CPI), moderated to 3.8% in Q3 (Q2 2017: 4.0%). The Consumer Sentiment Index declined to 77.1 in Q3 from 80.7 in Q2 2017. In 2017 the Ringgit appreciated by 9.2%, to RM4.08 per US dollar. Investment sales declined by 52% q-o-q to RM800m in Q4, but investment sales in 2017 increased by 7.0% y-o-y. Improved economic growth boost sentiments but a pending general election expected to be held in early 2018 will affect investment sales in H1 2018. The total office stock amounted to 81.7 million sq ft, with 2.3 million sq ft completed by end 2017. Average occupancy rate of office space declined to 80.4% from 81.4% in Q3 as weaker market conditions persisted despite a recovery in economic growth and oil prices. On a y-o-y basis, the occupancy rate trended downwards from 82.3% in Q4 2016. Retail sales contracted 1.1% in Q3 2017, swayed from projections of 2.9% and 4.0% by the Malaysia Retailers Association (MRA) and Retail Group Malaysia (RGM), respectively. 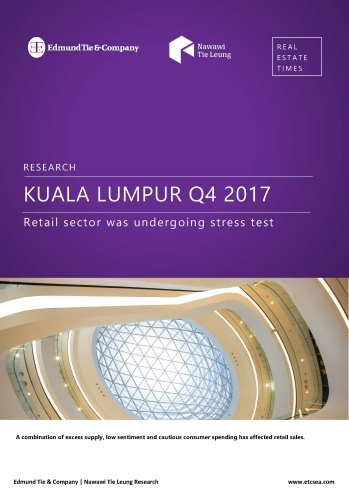 Malaysia Retailers Association (MRA) forecasted a 3.8% growth for the final quarter of 2017. In Q4 2017, three residential projects with a total of 1,432 high-end condominium units were completed, two of which are in the city-centre. Of the 9,693 units that were initially expected to complete throughout the year, only 5,315 units (or 55%) from 11 high-end residential projects were completed. Some 6,176 units of high-end condominiums are expected to come on board throughout 2018, with 51% of the upcoming supply coming from the city centre (Figure 9).